Passengers aged 10 or above require an adult ticket. Passengers aged 5 to 9 require a child ticket. A child under the age of 5 and accompanied by an adult with a valid ticket may travel for free provided that the child does not occupy a seat/sleeper. * Only tickets for Guangdong Line are available for tele-ticketing/e-ticketing for the time being. * Booking through the hotline is subject to a handling charge of HK$12 per ticket (for both adult and child). The handling charge is non-refundable under any circumstances. The transaction amount will be deducted from the credit card account automatically. * Passengers are required to collect tickets in person at one of the following locations with the credit card through which the booking is made. * No alteration can be made to the destination and class. * Ticket alteration must be made at the issuing office. * Alteration to northbound tickets of Guangdong, Beijing and Shanghai Line must be made 30 minutes before train departure. 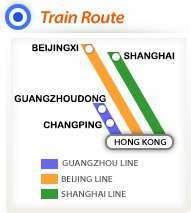 * Alteration to southbound tickets of Beijing/Shanghai Line must be made at least 2 days before train departure. * Only one alteration will be allowed for a ticket. * Altered tickets are non-refundable. * Immigration formalities are conducted at the departure or arrival station. * To avoid any delay, please arrive at the departure station earlier for exit formalities. Hong Kong Hung Hom Passengers are advised to arrive at Hung Hom Station 45 minutes before the scheduled departure time for exit formalities. The boarding gate will be closed 10 minutes before the train departs. Mainland Beijingxi Passengers are advised to arrive at the departure station 90 minutes before the scheduled departure time for exit formalities. The boarding gate will be closed 20 minutes before the train departs. Shanghai Passengers are advised to arrive at the departure station 90 minutes before the scheduled departure time for exit formalities. The boarding gate will be closed 15 minutes before the train departs. Changping Passengers are advised to arrive at the departure station 45 minutes before the scheduled departure time for exit formalities. The boarding gate will be closed 10 minutes before the train departs. For further information, please call the Intercity Ticketing & Service Hotline: (852) 2947 7888. Timetable and fares are subject to change. Please refer to the station notice for the most up-to-date information. The MTR Corporation has the absolute authority and at its sole discretion to refuse permission flammable/ toxic/ corrosive items whether or not they are listed above.